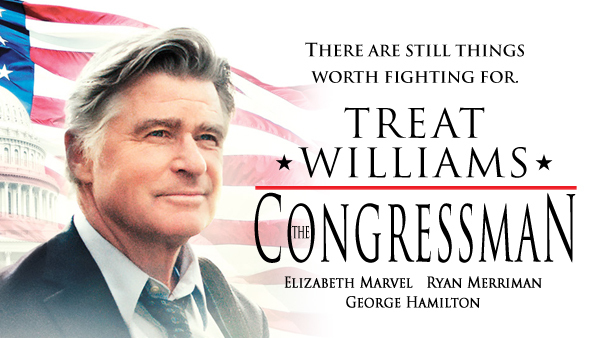 We looked after the North American release of The Congressman starring Treat Williams, a timely Political Satire directed by former Long Island Congressman Bob Mrazek. Released during the strangest political climate in recent American history, and in the build up to the November 8th, 2016 election, The Congressman touches significantly upon current hot-button topics. Charlie Winship (Treat Williams) is a seasoned Maine Congressman who has grown disillusioned with political infighting and special interest lobbyists. When a video of him failing to rise during the Pledge of Allegiance goes viral, he finds himself entrenched in a public firestorm. In addition to the media backlash, Charlie must contend with a conniving lobbyist determined to ruin his career (George Hamilton) and an advisor with a hidden political agenda (Ryan Merriman). Despite everything, Charlie agrees to help protect a small coastal village in his district of Maine from a powerful fishing conglomerate—all the while growing closer to the town’s librarian (Elizabeth Marvel). As Charlie experiences this passionate and idyllic view of the American dream, he must decide how far he’s willing to go to resuscitate his career. We handled all aspects of the PR, social media and digital marketing campaign, shaping and sharing engaging digital content, strategic advertising, organic social media, and securing reviews, features, interviews and digital content both nationally and locally. Publicity highlights include The Hollywood Reporter, IndieWire, Variety.com, HuffPost, People.com, The Washington Times, BeliefNet, AARP.org, The Atlantic, Parade.com and many more.